Click on the pattern name to read the description, movements and video. The ancient law in the Orient was similar to the law of Hamurabi, “an eye for an eye, a tooth for a tooth,” and was rigorously enforced even if death was caused accidentally. In this type of environment, and since the present system of free sparring had not yet been developed, it was impossible for a student of the martial arts to practise or test his individual skill of attack and defense against actual moving opponents. Individual advancement was certainly hindered until an imaginative practitioner created the first patterns. The student systematically deals with several imaginary opponents under various assumptions, using every available attacking and blocking tool from different directions. 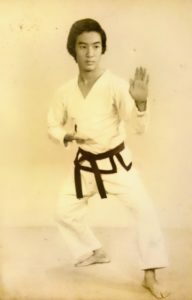 Thus pattern practice enables the student to go through many fundamental movements in series, to develop sparring techniques, improve flexibility of movements, master body shifting, build muscles and breath control, develop fluid and smooth motions, and gain rhythmical movements. It also enables a student to acquire certain special techniques which cannot be obtained from either fundamental exercises or sparring. In short, a pattern can be compared to unit tactics or a word, if fundamental movement is an individual soldier’s training or alphabet. Accordingly, pattern, the ledger of every movement, is a series of sparring, power tests, feats and characteristic beauty. Though sparring may merely indicate that an opponent is more or less advanced, patterns are a more critical barometer in evaluating an individual’s technique. Pattern should begin and end at exactly the same spot. This will indicate the performer’s accuracy. All patterns in this book are performed under the assumption the student is facing “D” (see pattern diagrams). There are a total of twenty-four patterns in Taekwon-Do. The life of a human being, perhaps 100 years, can be considered as a day when compared with eternity. Therefore, we mortals are no more than simple travellers who pass by the eternal years of an aeon in a day. Here I leave Taekwon-Do for mankind as a trace of man of the late 20th century. The 24 patterns represent 24 hours, one day, or all my life.